The CMBA profiles two classic movie blogs per month. Today we're featuring Amanda from Old Hollywood Films. Amanda at Old Hollywood Films brings a clear-eyed, journalistic approach to classic film. Like any good journalist, Amanda concentrates on the important or most interesting aspects of a film she's reviewing. Her posts are lively and informative. In addition to film reviews, she presents a weekly TCM Viewer's Guide that includes celebrity birthdays, TCM daily highlights, and a helpful feature entitled "Best Day to DVR". 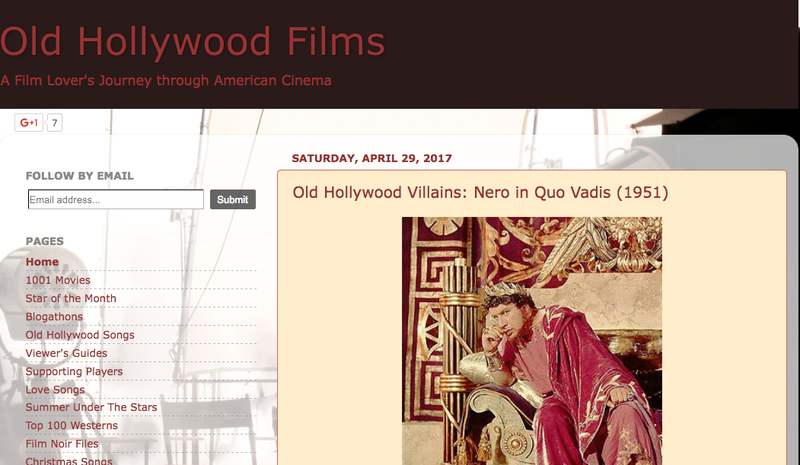 Old Hollywood Films provides historical context with film reviews, which reflects Amanda's interest in history. One example is The Grapes of Wrath (1940). "I think this film is a good illustration of films depicting history (in this case the Great Depression)," she says. In her review she notes, "[N]o one experienced more misery than those Americans who survived the Dust Bowl, which was one of the worst environmental disasters in American history." Celebrate National Classic Movie Day with the Five Stars Blogathon! For the third consecutive year, the Classic Film & TV Café will celebrate National Classic Movie Day on May 16th by hosting a blogathon. This year, it will shine the spotlight on those actors and actresses that made the Golden Days of Hollywood glitter brightly. 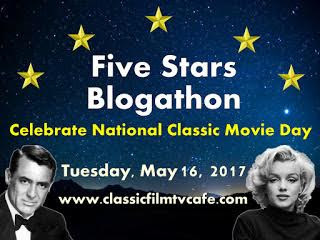 The Five Stars Blogathon invites bloggers to list their five favorite movie stars and explain why you love them. It's that simple. If you want to participate, click here for more information and leave a comment with your blog's name and URL. You can also just send the information to: rick@classicfilmtvcafe.com. The CMBA profiles two classic movie blogs per month. Today we're featuring Cameron from The Blonde at the Film. Cameron from The Blonde at the Film is like a gemologist who examines precious stones and determines their worth. Her site evaluates a film and, much like a jeweler, places it in a setting to show us its unique characteristics. Cameron provides an impressive amount of research, which helps readers see why so many classic films are noteworthy. Her research also highlights social conventions that reflect the times in which these films were made. She's enthusiastic about classic Hollywood films and actors, especially when it comes to Esther Williams. "With classic films," she says, "context is key, and this is especially true with a star like Esther Williams who was so 'of her time' and whose movies can seem dated and only 'classic' in the academic sense (though I disagree, of course!). I tried to make Williams and her movies more accessible and relevant by showing what a talented athlete she was and that it wasn’t so crazy for MGM to come calling."